An adaptation of Matt Bondurant‘s 2008 novel The Wettest County in the World and directed by John Hillcoat, Lawless follows these three brothers – Forrest (Tom Hardy), Jack (Shia LaBeouf) and Howard (Jason Clarke) – who, in a Prohibition-era Franklin County, Virginia, find their bootlegging business under threat by a new deputy (Guy Pearce) and other authorities who want a cut of their profits. Let’s start off by saying that before I watched Lawless for the first time, I was adding The Assassination of Jesse James to the top of my favourite westerns. A very similar film in terms of story, Lawless also follows a true story and is set in a similar time period. Unfortunately, I found myself less interested in the plot of Lawless then I thought I would as the film lacked any kind of engagement. With no single point drawing me in or gripping my attention at any point, there was very little I reacted to and I, therefore, remained on the fence throughout. What I thought would swing this film in my favour was the acting, but this was another factor that I was let down by. Shia LaBeouf was pretty decent and I’m enjoying more of his recent roles, but Tom Hardy was somewhat inhuman and completely let me down; I barely understood a word he said (I understood Bane more, let’s put it that way) and his movements were so rigid that I was starting to believe he was just a block of pure muscle. Instead, it was all about Guy Pearce, who gave an excellent and somewhat fearful performance. What would have been even better though was if Gary Oldman had a bigger role, as there wasn’t nearly enough of him. Also starring Mia Wasikowska and Jessica Chastain in the female supporting leads, both are brilliant actresses but again their characters didn’t have enough of an impact to stand out much. There was no real chemistry between any of the characters and their relationships, therefore, didn’t matter enough. It all felt very empty, I felt, with this lack of depth entertaining me about as much as Tom Hardy smiled (not at all). If for nothing else, Lawless looks pretty great and the scenes of violence are done well, but that’s as much as I got out of it. I was hoping for more, to say the least. 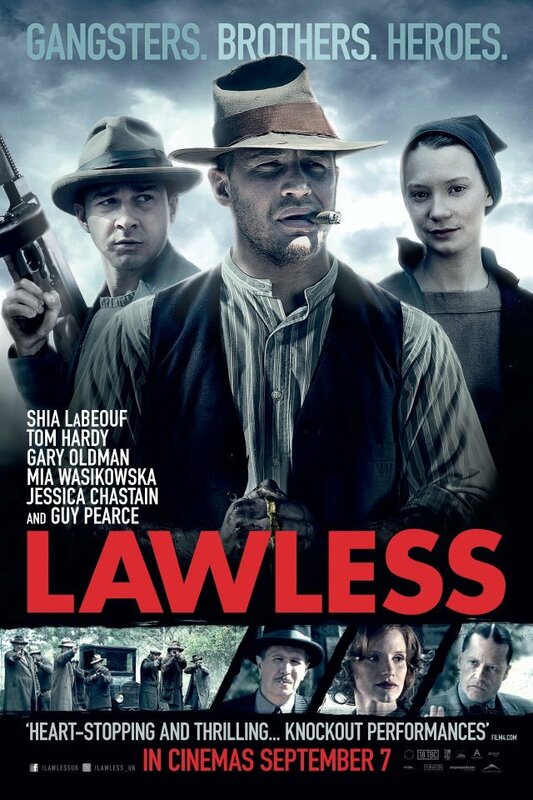 Lawless was released on DVD on 14th January.